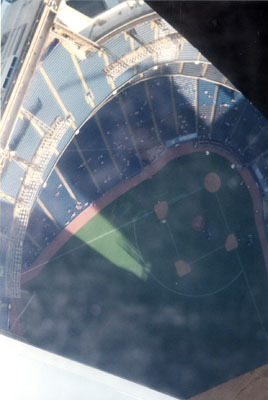 The subway drops you off really close to the stadium (+1), and parking is pretty ample around the stadium (+1). The traffic can be pretty bad after games, though, so the subway is probably the best option (+1). 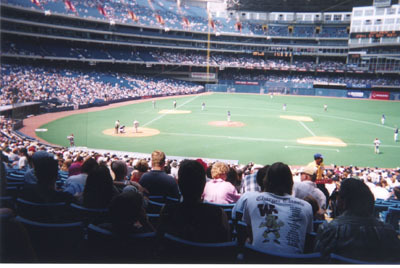 Tickets for a Blue Jays game are fairly reasonable (+1) and are pretty easy to come by since the stadium can hold nearly 50,000 fans (+1). The seats, though, are all pretty far away from the field (-1) and have the same problem at Fenway in that the seats don't all face the plate and you have to strain your back to watch the game (-1). It's the same problem many multi-purpose stadiums have (I don't know what Fenway's excuse is, though). 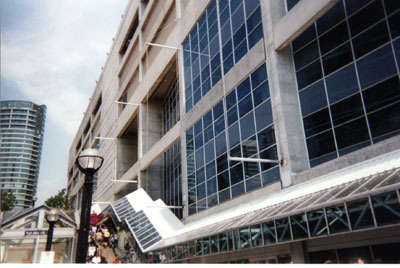 The CN Tower is just outside the stadium and there is usually plenty going on before and after a game since the stadium is in downtown Toronto (+1). The stadium itself is a pretty bland structure with a few generic statues and not much else (-1). 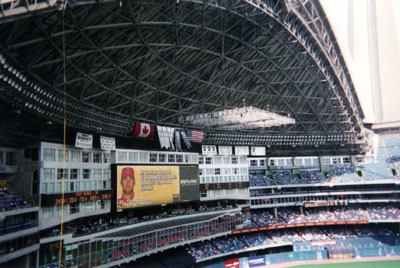 The retractable roof was one of the first of its kind and the stadium is halfway decent when it's open (+1), but when it's closed it is as bad as the Metrodome (-1). There really isn't much else of note inside the stadium. Even though the stadium isn't all that old it doesn't include a concourse that gives you a constant view of the game (-1). The videoboard at Rogers Centre is one of the biggest in the world (+1) and while it now pales compared to the boards on the S0uth Side of Chicago and Nationals Park it still looks pretty good (+1). However, with a scoreboard as big as the one they have you would think it would have all the information you need. There is no out-of-town scoreboard, though, and the other games scroll on the main board, which makes it easy to miss the game you are looking for (-1). There isn't too much for kids at the Rogers Centre. They do have games for kids on select Saturdays (+1) and kids can run the bases on certain Sundays (+1), but there is no play place or anything for little kids (-1). It was pretty quiet and barren at the stadium (-1) and the fans didn't seem too into the game (-1). At least they didn't do the wave (+1). The ushers are nice enough (+1), but they will chase you out if you try to sneak into a lower section (-1). This makes sense at places that are packed, but I hate when it is done at half-empty stadiums (-1). "Take Me Out" (+1) is a part of the stretch, but before it fans are lead in actual stretching exercises (+2). It's an awesome idea (+1) and it's always great when a stadium has a unique idea for the stretch (+1). Wayne Gretzky's Bar is nearby (+99) and there is a lot more to do within a few minutes of the stadium since it is in the heart of downtown Toronto (+1).